A flash mob is a group of people who assemble suddenly in a public place, do something unusual for a brief period of time, and then quickly disperse. They are usually organized with the help of the Internet or other digital communications networks. The Wikipedia seems to be unaware of an earlier usage of the term. Update July 9: Google reveals that the image is a 2004 painting by Peter Gouldthorpe. 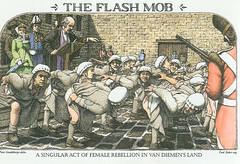 The Flash Mob is an actual historical phenomenon -- more details about this group and Tasmania's other female convicts here.